A lease agreement format or template is made for the layman to prepare a lease agreement by following this guided pattern. Often this helps you make an agreement by just referring to the template, and you need no more external advice. The lease agreement establishes the relation between the lessor and lessee, the two parties involved in the contract officially and legally. This therefore eliminates any risk of future conflicts in legal ground between the two. 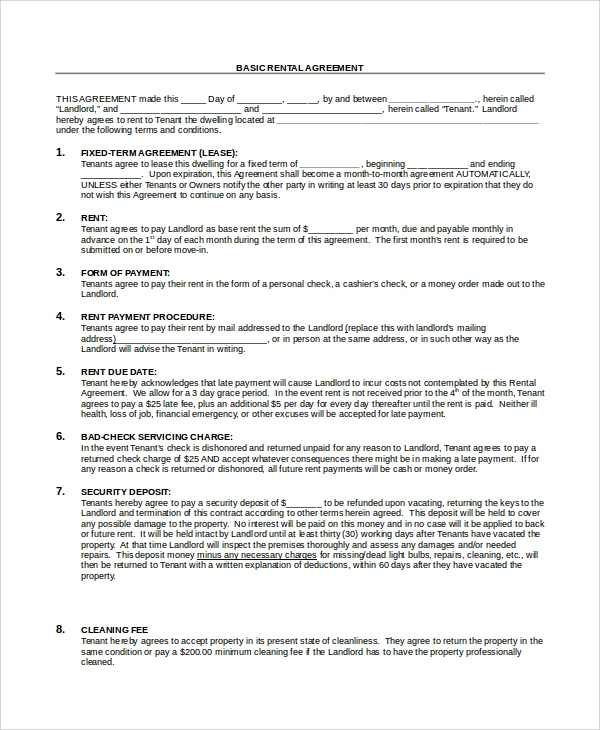 If you are planning to give your apartment on lease to a party, then you must get this agreement template. This one is made with due specification about leasing an apartment, with all particulars about residential leasing. 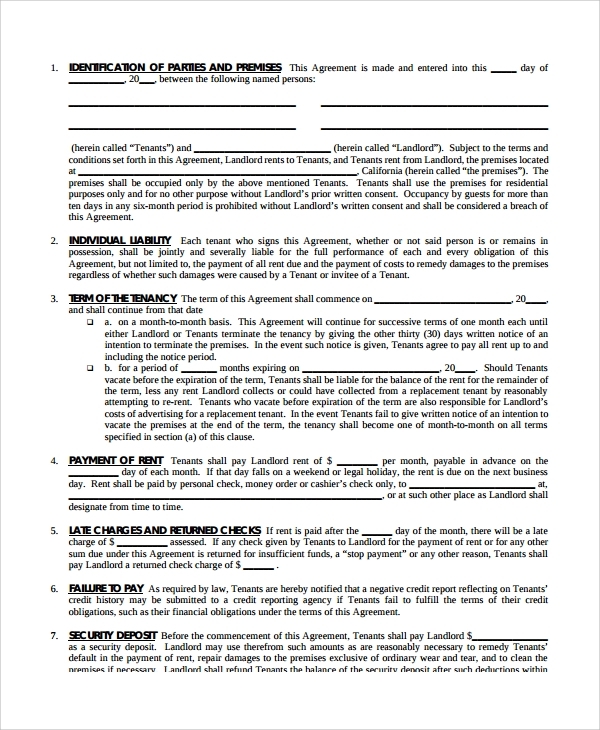 The basic form of a lease agreement is a very handy template, and often can be used in varied forms. Whatever is your requirement you may use this basic format to suit all, and you will not have to go for specification if you have any rare one. Using this basic one will steer you through the process to prepare a nice agreement. The blank lease agreement is the simple lease agreement format, which is blank, or with fields which needs to be filled up. this one provides a basic form of lease agreement which can be used by any person to make a normal lease agreement without much specifications or specializations. 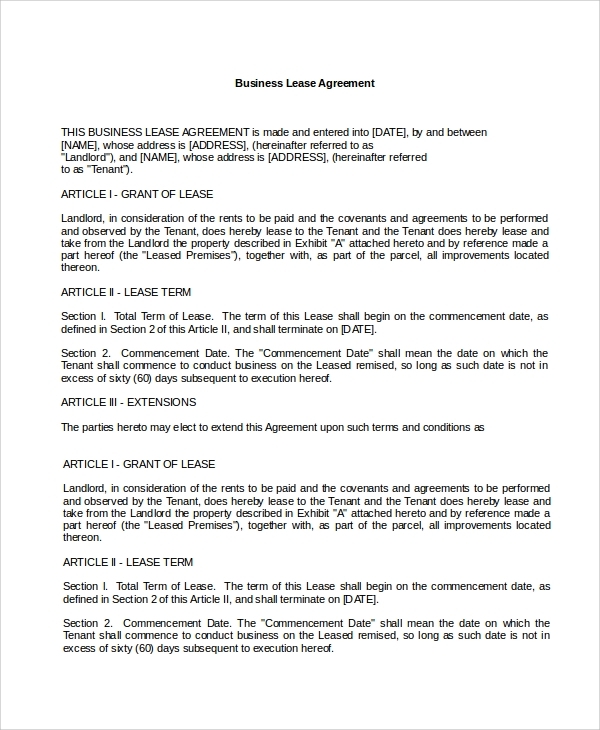 If you are leasing the property or space for business, then you must get into a business lease agreement with the party. This will ensure that you may keep in points about business usage and customer interaction and usage of the space. The template will help you include such points. The commercial lease agreement is just an advanced form of the business lease agreement, where the agreement specifies leasing the property for a commercial usage. It may be business or some organizational use or other ecommerce reacted use too. The vehicle lease agreement is simple about leasing the vehicle. If you are the owner of a vehicle, small or big, then you would need to make a contract with the leasing party with the help of this template. This has specific points for leasing of a vehicle. 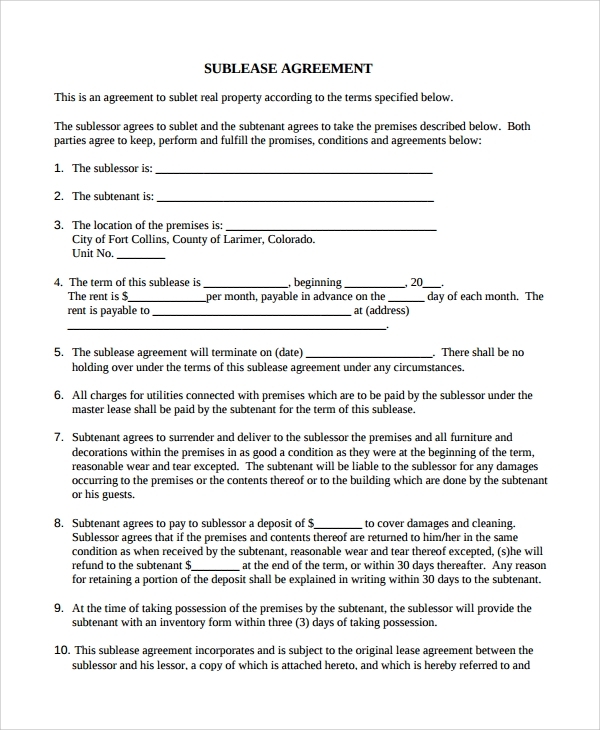 If you are already using a property as the lessee and are looking for an agreement format to lease this again to another party, then you would need this sublease agreement. This enables leasing of the already leased property to another sub lessee. The equipment lease agreement is a simple format, wherein you lease your valuable equipment to a party, and make this agreement using the template to keep a record. 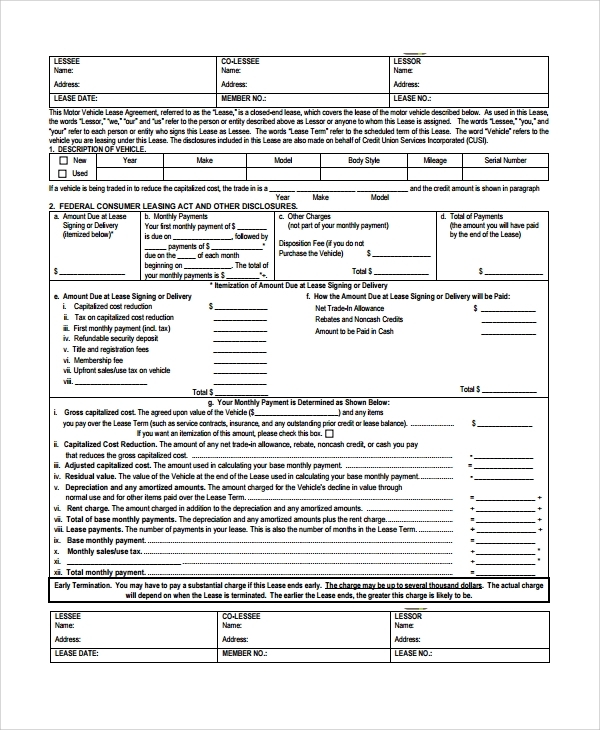 If you are leasing your employees then you would need this template. This is one such situation, where you lease some of your employees to another party, and you get the rent of that. This template helps make an agreement to conform this legally. 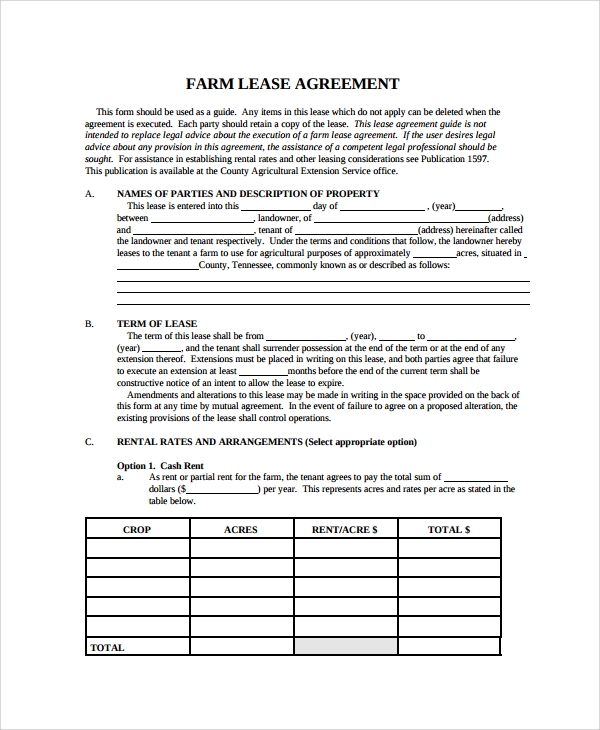 The farm lease agreement is the agreement you make when you are leasing your farm. 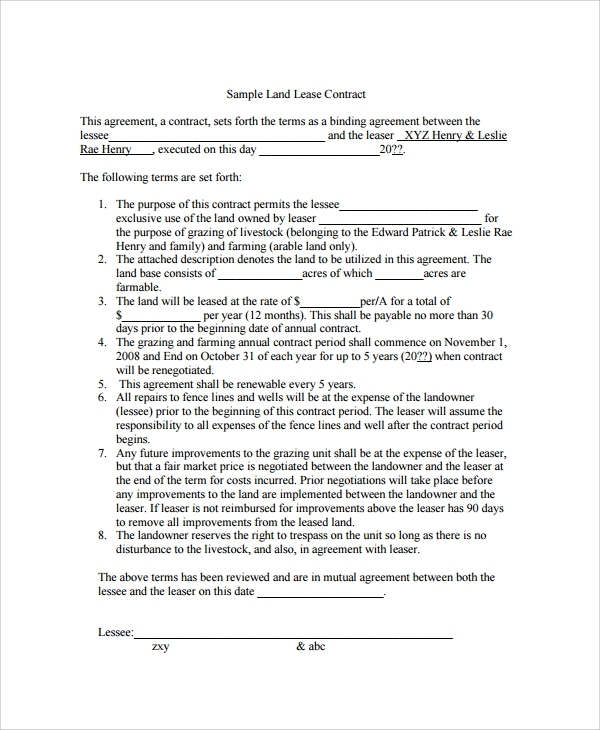 This is another template which will help you make the agreement papers at ease for leasing the farmland. Leases are often for a long term. But sometimes you may have to lease for short term. This template helps you do so. 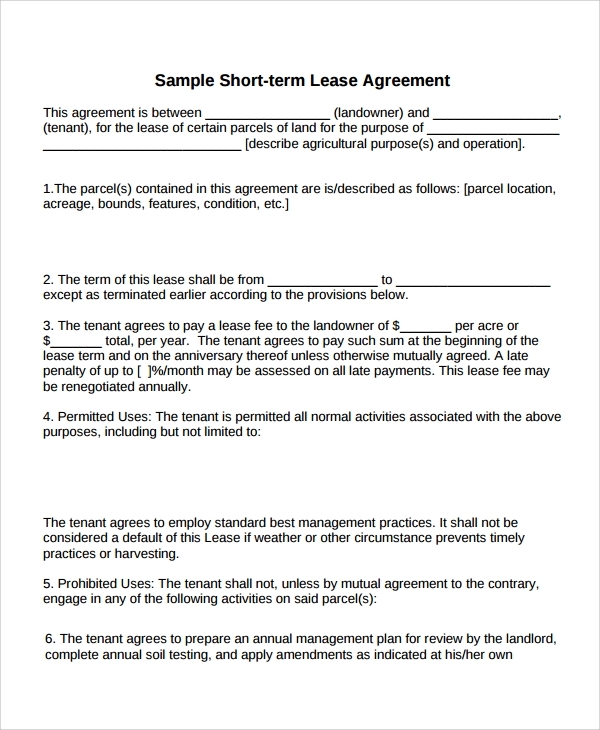 Anything you lease on a short term can be recorded using this agreement template. The ground lease agreement is for leasing your ground or space. 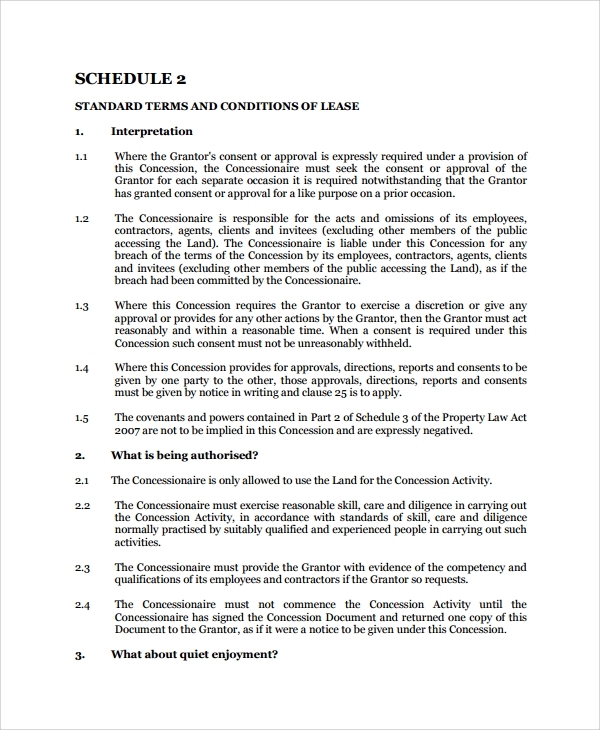 This template will give you some simple and essential guidelines and points so that you may easily make the agreement format ready for the ground leasing. The house lease agreement is naturally as the name suggests a simple agreement for leasing of the house. This can be for commercial use or residential. 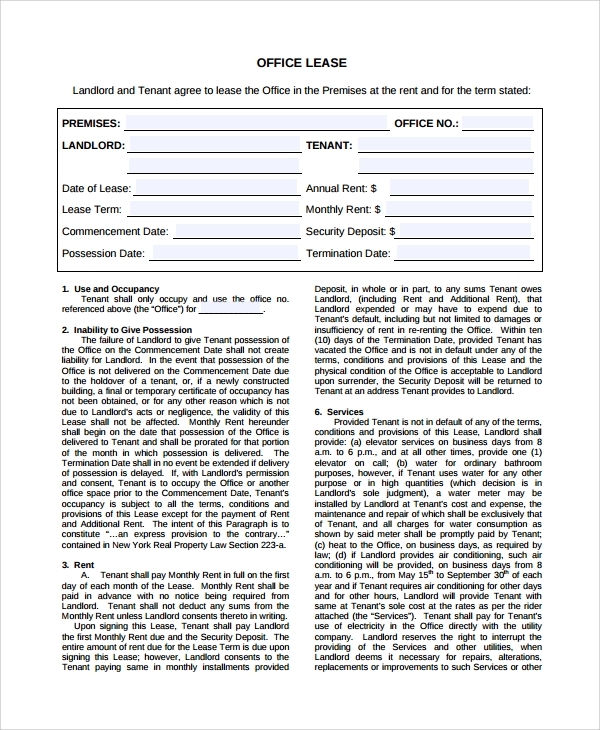 Normally deemed for residential use the house lease or rental contract can be made through the use of this template. 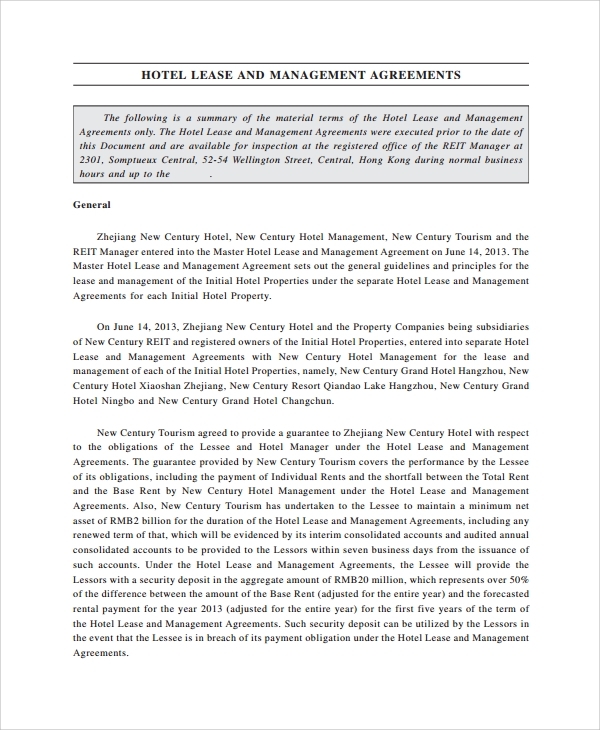 A hotel lease agreement is often used by hoteliers to lease their hotel to another party for business for some time like one year, 3 years or more. 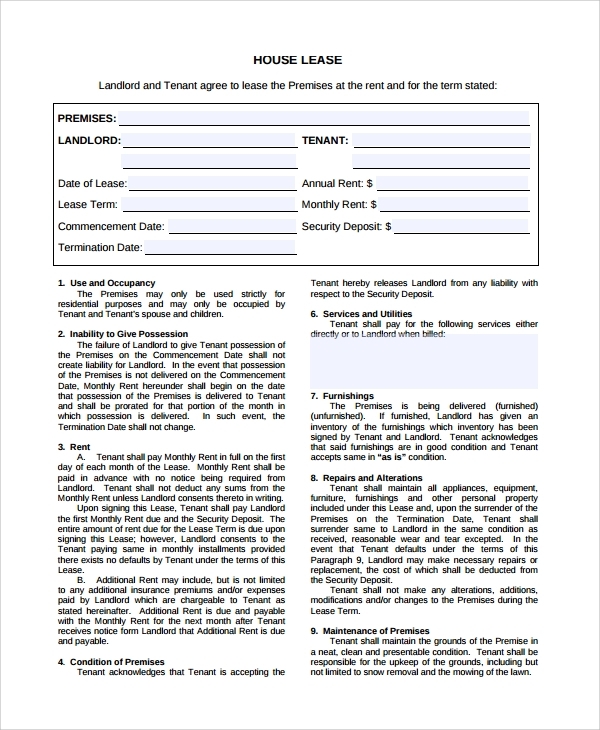 This format of the template gives you a set pattern deemed standard for such hotel lease agreements. As the name suggest, this format is not so formal and not very official style to form the agreement. It’s a format you may use in haste when you are leasing the property to a near one, and just need to make an agreement for the sake of formality. 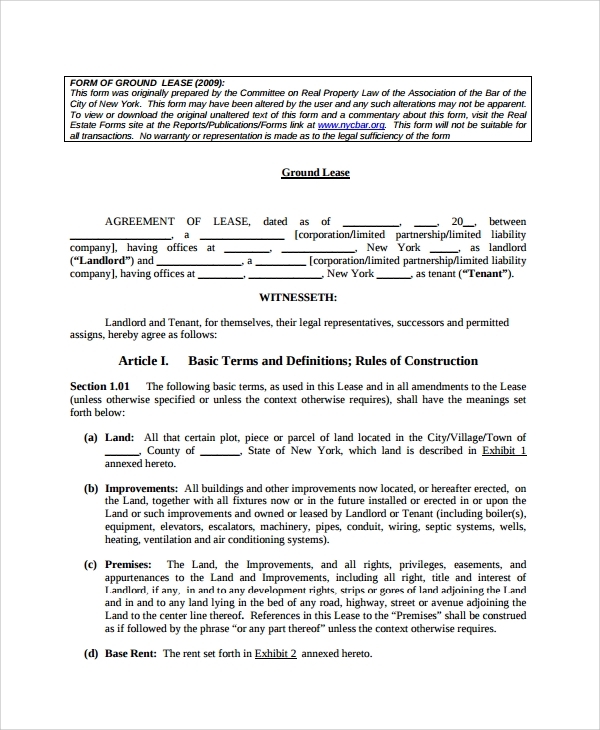 The land lease agreement is the plain lease agreement you make for leasing the land. It can be for any purpose which will be mentioned with full clause and rights on the agreement. This template is of much use for land owners leasing land therefore. 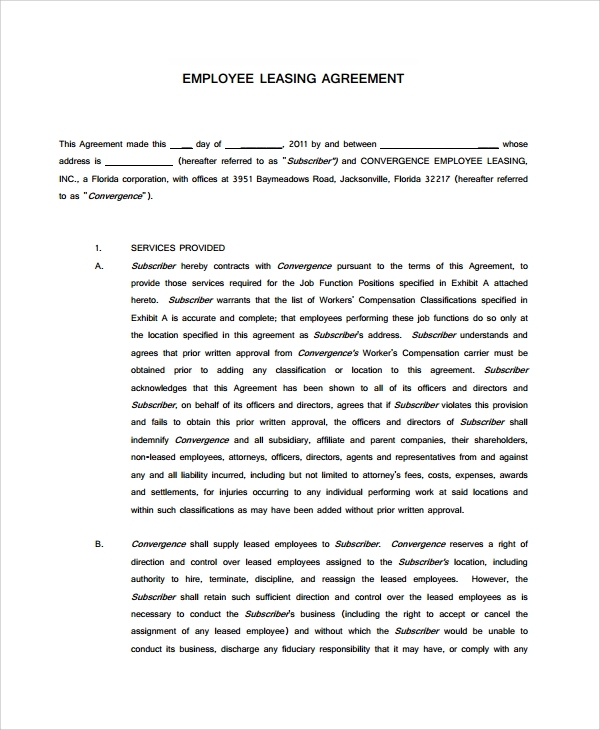 The office lease agreement is a smart and official format, which you will use to lease the office. This is generally for commercial or official use. And the use of this format is much common, as many offices are leased for long terms and used for ages. 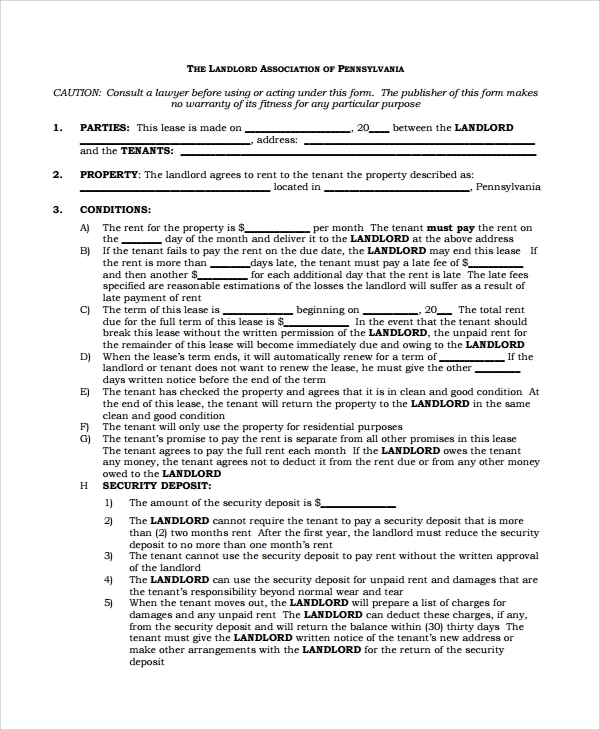 The property lease agreement is a generalized format for leasing your property. This can be fitted into any sort of leasing. You will just have to specify which property you are leasing with full details. This format can be used anywhere with universal application. The rental lease agreement is for renting a property. Use this simple format, to specify the item you are renting, and you are done. The rental lease agreement would help you get a complete format ready on time after you get the rental application from the applicant. 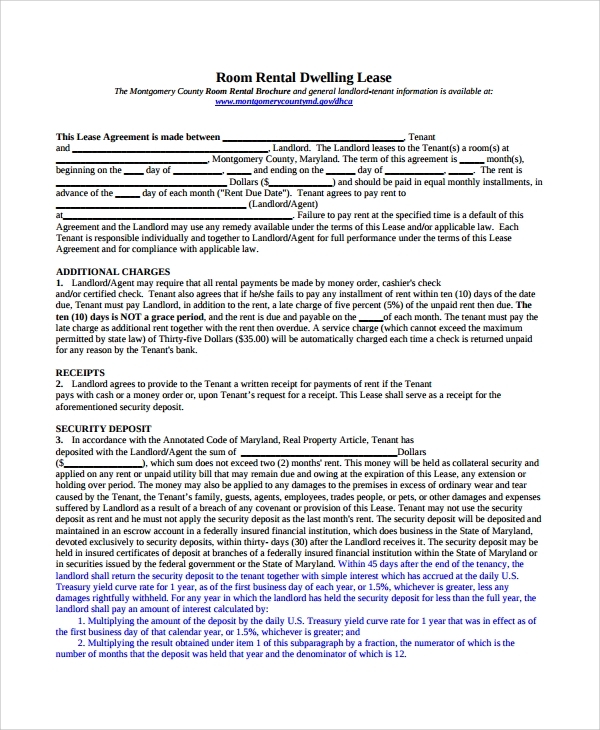 The residential lease agreement is a nice format you may use to show any property, space, house or apartment, which you are renting or leasing for residential purpose only. This template will have strict specifications of using the property for residential use only. 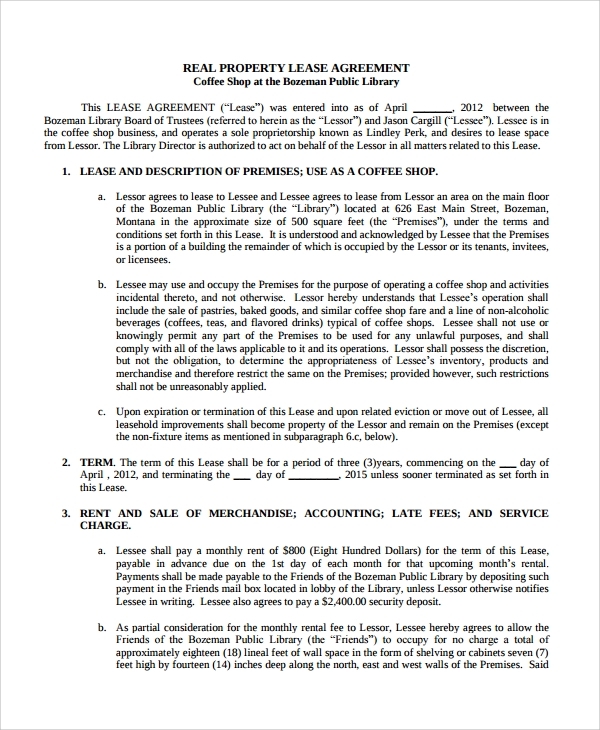 If you are leasing your shop, and want to make an easy agreement for this, just refer to this template. Get the agreement ready in minutes or hours, and lease your shop while mentioning all important points worth noting and following. 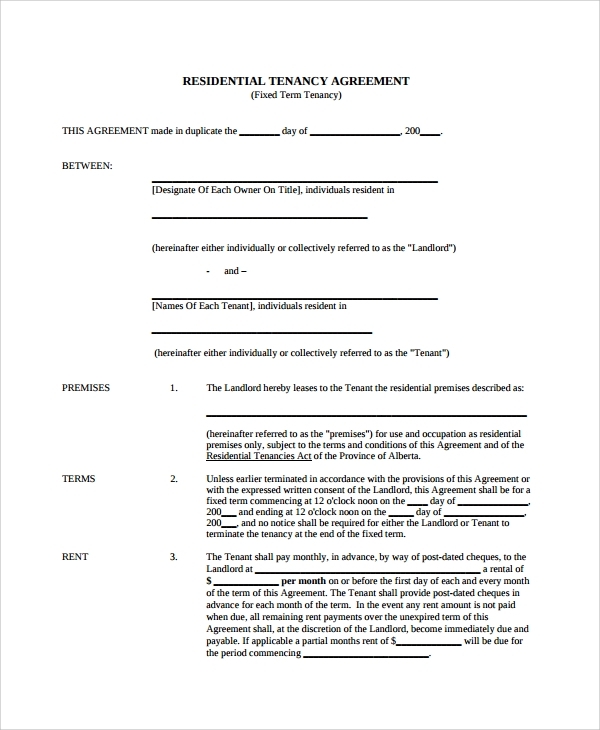 The tenancy agreement template will help you make an agreement for your tenants. If you have tenants, and you are leasing your tenants to some other concern, then you would need this specific format to express the same. 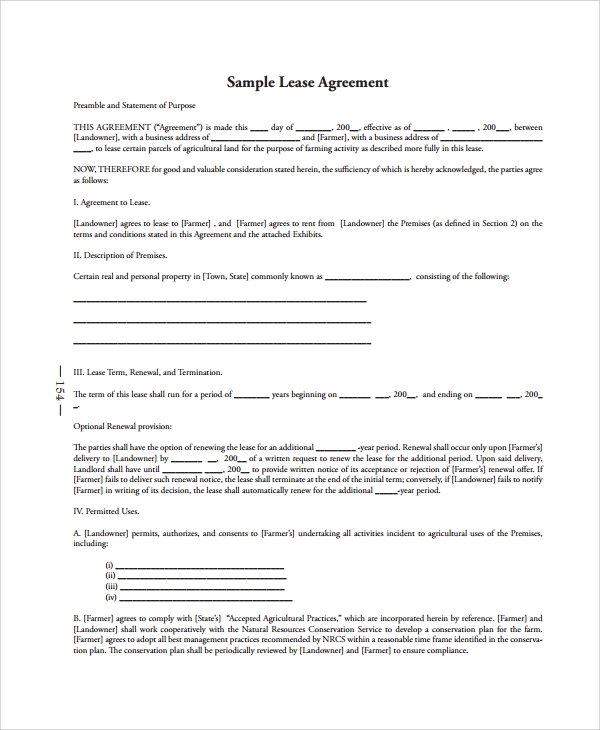 The sample lease agreement is a much simplified sample or format. This will give you an overview of how exactly lease agreements are made. You may just follow the sample, and write one on your own. 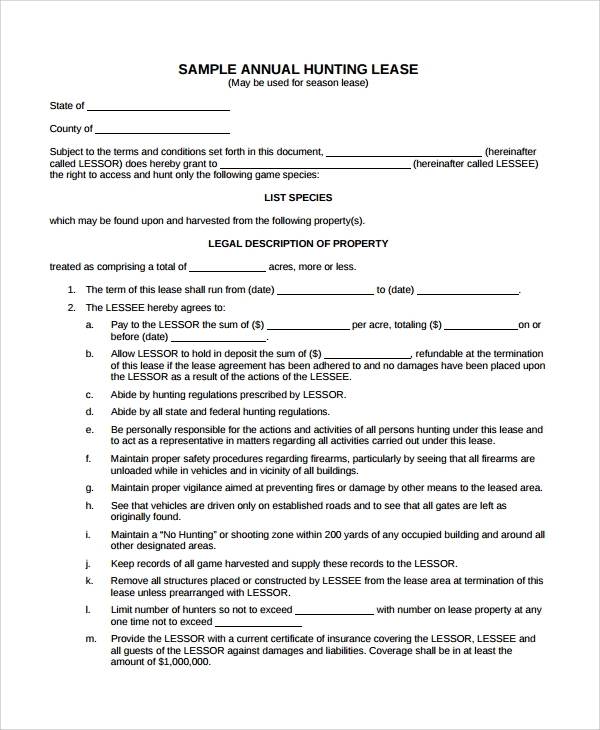 If you own a property or jungle type land, and you want to lease some portion or full land, to be used for simple hunting ground, then you can use this template to specify the same and form an agreement. 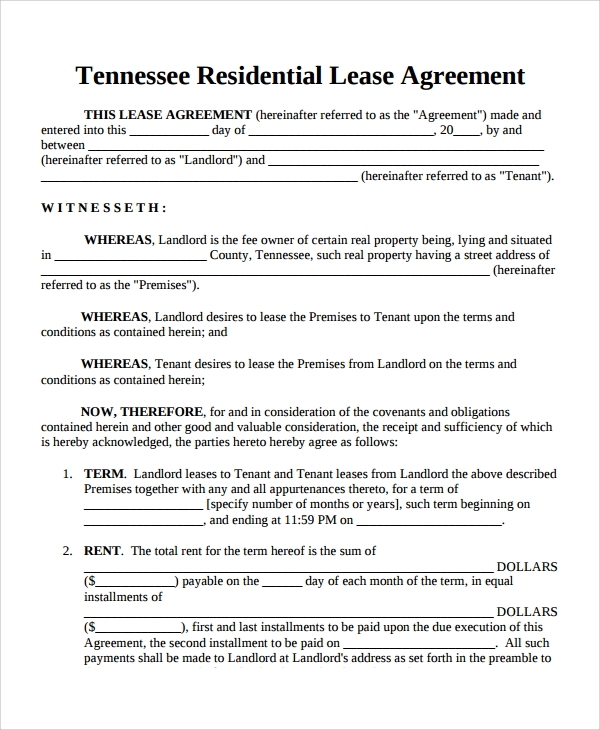 What is a Lease agreement Template? A lease agreement is the agreement formed between the two parties one of whom is the tenant and another is the landlord. When a piece of property is taken on a lease, which is one kind of renting or right to use the property for a long term on payment of an amount, then such agreements are formed. The agreement defines many aspects about the contract entered. The time for which the property like the residence, or commercial building, floor, room or space etc will be used by the tenant or lessee, the amount which has to be paid at a time during the formation of the contract to the lessor or owner of the property, the property rights, the dos and don’ts and much more. All of this information has to be properly written on a legal paper to make the lease agreement. The template which defines or outlines the format, which can be followed fully to make such an agreement, is the lease agreement template. 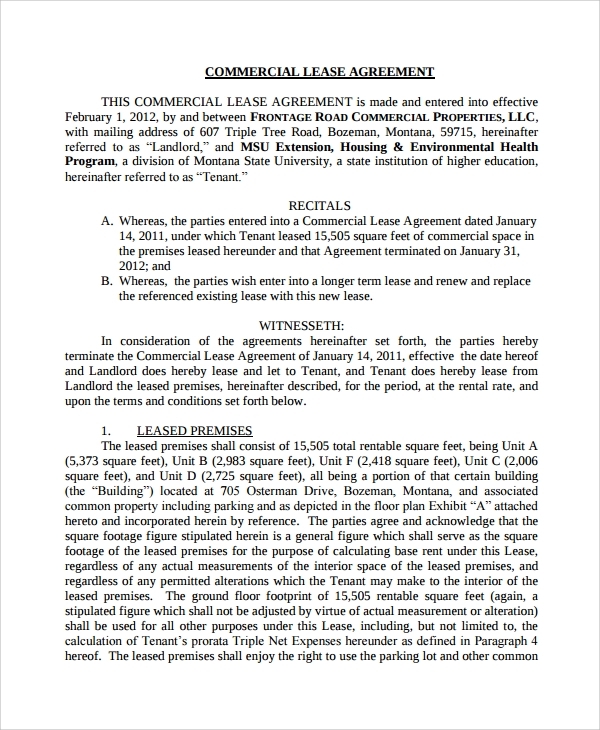 What is the Use of a Lease Agreement Template? The use of a lease agreement template is much obvious, whenever the lessor or lessee is trying to make an agreement paper on his own without involving any professional legal assistance or hiring a lawyer. These agreement formats are made by professionals, who know it all about law and legal formats. That is why you would see a typical professional style and the accuracy about these formats. It’s for their perfection of format and accuracy that one can fully depend on a lease agreement format downloadable from online resources, to make a nice agreement of lease. The templates can be seen and read to understand the format of writing and the same can be replicated to form a personalized lease agreement. Again, the templates with blanks and gaps are also found, which can be simply edited and filled on gaps to prepare a customized agreement. Both ways, the templates give in a secured way to form a lease agreement without any errors. Why Lease Agreement Templates Should be Used? The lease agreement templates should be used simply to form an accurate form of agreement without errors. Just imagine that without any idea of the style of legal writing you may not be able to ever prepare any legal format or agreement. It is just for the help you are getting from readymade formats or templates, that you may attempt making an agreement on your own, without any external legal assistance. It is this side or benefit of the templates, which gives the courage and confidence to any layman to prepare a lease agreement on their own. You don’t need any other tool or law degree, and just a properly formatted agreement of the exact type you are looking for. Then you may simply read, understand, and add in your particulars, and the details of the leasing party to get a complete agreement ready in minutes or hours. It is just as simple as that, saving you time, effort, money and harassments. Who Can Use the Lease Agreement Templates? The lease agreement templates can be used by any person, who has the time and interest to attempt and make one agreement by just following the style or format in an agreement template. If you are not sure how to do this, you just need to study a little. New entrepreneurs, the new landlords, the new property owners etc, who are leasing for the first time, would need to see a format, so that they can make one on their own! 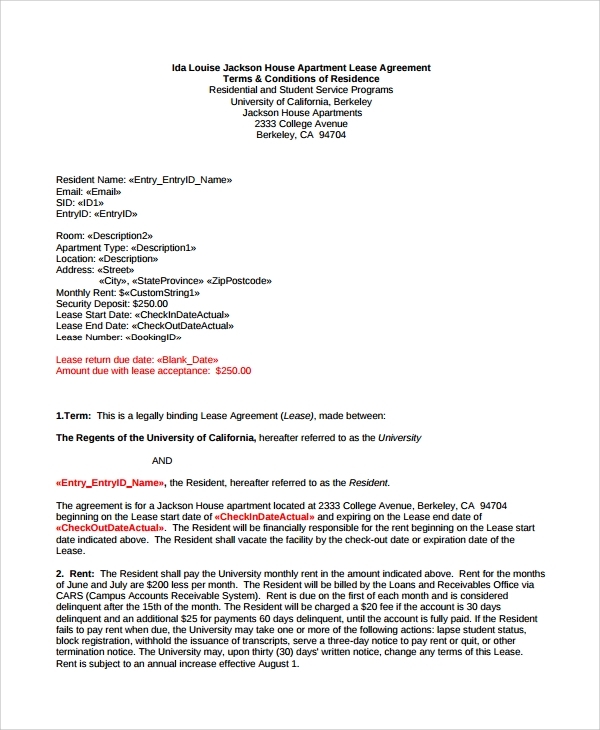 Again if you are the leasing party and just want to be sure that your lessor is using the right format to make the agreement with you, then you can also refer to a few contract or agreement styles, examples, and templates. This will give you an idea of how should the agreement look like. Anyone can use a lease agreement template, and in fact a lawyer can also have a look sometimes to refer the various styles which are in use worldwide. The Benefits You may Enjoy upon Using Lease Agreement Templates? The benefits you get from the use of lease agreement templates are many. You don’t have to hire a lawyer where most of the expense is saved. Next, you don’t have to invest much time, as in fact finding a lawyer, talking to the one, and explaining requirements, and finally waiting for the ready papers takes some time, and is never completed in less than 1-2 days at the least. Compared to this whole process, when you are working with templates, you actually prepare an agreement in just hours. You simple need to download the format you need and like the most to get started, and then you can simply add in the details to get the agreement ready. This is a time and effort saver, and money saver definitely. Thus you get a ready platform to work on without any hassle. A great benefit of working with templates is that you get accuracy and perfection, and no errors may creep in as you are doing it all by just filling the gaps as mentioned with examples. How to Use the Lease Agreement Templates? Using the lease agreement templates is a pretty simple process. You will have to start by downloading an agreement format first. There are so many formats available for download, and they are designed by keeping in mind the varied uses and requirements of people. That is why once you decide the style and specification, you can instantly find one similar and download. 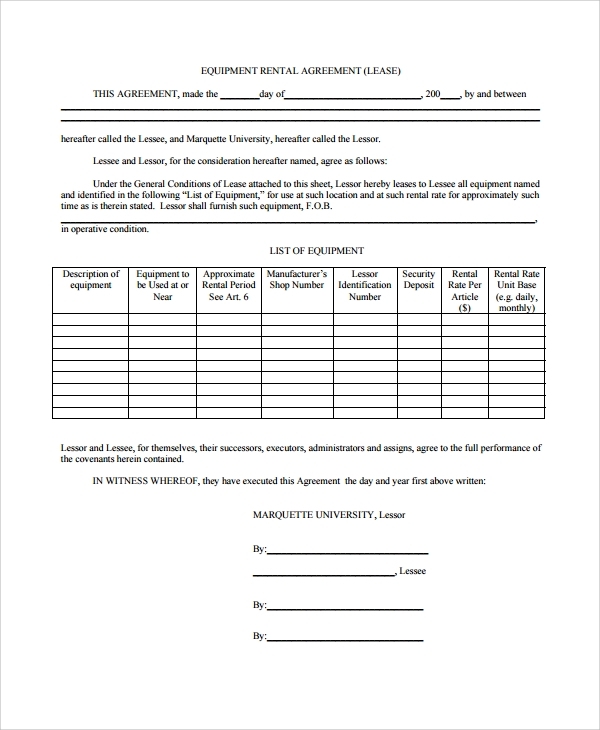 These agreement templates are available in easy to read and edit formats. Some are in PDF and some in Word, and some are free, while some are reasonably charged. Finally what you get is a smart and easy to use sample or format, which you may read and edit on places to enter your details and particulars of the other party. Continuing this, you finally end editing or customizing, and the whole agreement gets ready through your hands. When you know how to build your own copy or sheet of the lease agreement, why go elsewhere. You can sit in the comfort of your home or office to fetch a format, and then work on it to get a proper and perfect copy of agreement ready, and it will be officially, universally and legally accepted anywhere after registration.